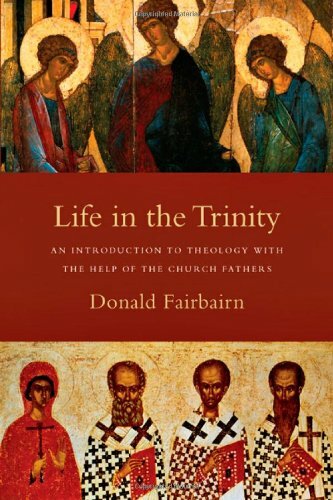 This post continues a series in the book Life in the Trinity by Donald Fairbairn. For other posts in the series, click a number: 1, 2, 3, 4, 5, 7, 8. Jesus, through his vicarious humanity, has recreated us in God's image, thereby undoing our death (corruption). As Fairbairn notes, "death died with the death of Christ, and we who were in slavery to death have now been set free... Christ's death [is]... both a sacrifice to remove wrath/guilt and.. a victory over the demonic powers that hold us captive to death" (p165 and note Col 2:13-15 and Hebrews 2:14-17). What Scripture compels us to say, and what the early church recognized, is that somehow God the Son died for us... We turned away from God. We lost the share in the fellowship between the Father and the Son that God had given us at creation. We are born spiritually dead, enslaved to death and the devil, and unable to return to God. How can this terrible situation be remedied? By an atoning sacrifice. The consequence of sin is death, which implies both physical separation of the soul from the body and, more significantly, alienation from God. So if human beings are to be restored to life, then a substitute must be brought forth who can take that alienation away from us by taking it upon himself. The entire Old Testament sacrificial system testifies to the necessity of such a sacrifice, and the repetition of the Old Testament sacrifices shows that they do not provide that sacrifice; they merely symbolized it. So who or what could be this sacrifice? It had to be a human being, since only a human would qualify to die in place of other men and women. He had to be a sinless human being, one who had never lost his share in the love between the Father and the Son, since a sinful human being could die for his own sin, but not for someone else's. And he had to be able to die not just for one other person's sin but for the sin of many people at once, indeed for the sin of the world. Thus he had to be somehow an infinite human being, whose life would be of such infinite value that it could be laid down for the sin of the world rather than just for the sin of one or two other people. Who then qualifies to offer such a sacrifice? Who is fully human and utterly sinless and yet also infinite? Only the incarnate Word, God the Son after he has become a man. And this, John says, is the one whom God sent specifically to offer the atoning sacrifice. (pp166-167, and see 1John 4:7-12 and Romans 5). Through the humanity of the Son of God, who died and rose for us and with us, death and Satan have been conquered. The fall has been reversed; humanity has been recreated; and as a consequence, human fellowship with the triune God, who alone is immortal, is restored. Thank you Jesus!